The conservation and restoration of cultural heritage focuses on protection and care of tangible cultural heritage, including artworks, architecture, archaeology, and museum collections. Conservation activities include preventive conservation, examination, documentation, research, treatment, and education. This field is closely allied with conservation science, curators and registrars. The scope has widened from art conservation, involving protection and care of artwork and architecture, to conservation of cultural heritage, also including protection and care of a broad set of other cultural and historical works. Conservation of cultural heritage can be described as a type of ethical stewardship. Often there are compromises between preserving appearance, maintaining original design and material properties, and ability to reverse changes. Reversibility is now emphasized so as to reduce problems with future treatment, investigation, and use. In order for conservators to decide upon an appropriate conservation strategy and apply their professional expertise accordingly, they must take into account views of the stakeholder, the values and meaning of the work, and the physical needs of the material. Cesare Brandi in his Theory of Restoration, describes restoration as "the methodological moment in which the work of art is appreciated in its material form and in its historical and aesthetic duality, with a view to transmitting it to the future". 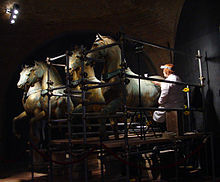 Some consider the tradition of conservation of cultural heritage in Europe to have begun in 1565 with the restoration of the Sistine Chapel frescoes, but more ancient examples include the work of Cassiodorus. The care of cultural heritage has a long history, one that was primarily aimed at fixing and mending objects for their continued use and aesthetic enjoyment. Until the early 20th century, artists were normally the ones called upon to repair damaged artworks. During the 19th century, however, the fields of science and art became increasingly intertwined as scientists such as Michael Faraday began to study the damaging effects of the environment to works of art. Louis Pasteur carried out scientific analysis on paint as well. However, perhaps the first organized attempt to apply a theoretical framework to the conservation of cultural heritage came with the founding in the United Kingdom of the Society for the Protection of Ancient Buildings in 1877. The society was founded by William Morris and Philip Webb, both of whom were deeply influenced by the writings of John Ruskin. During the same period, a French movement with similar aims was being developed under the direction of Eugène Viollet-le-Duc, an architect and theorist, famous for his restorations of medieval buildings. Since 1998, Harvard University wraps some of the valuable statues on its campus, such as this "Chinese stele", with waterproof covers every winter, in order to protect them from erosion caused by acid rain. Conservation of cultural heritage as a distinct field of study initially developed in Germany, where in 1888 Friedrich Rathgen became the first chemist to be employed by a Museum, the Koniglichen Museen, Berlin (Royal Museums of Berlin). He not only developed a scientific approach to the care of objects in the collections, but disseminated this approach by publishing a Handbook of Conservation in 1898. The early development of conservation of cultural heritage in any area of the world is usually linked to the creation of positions for chemists within museums. In the United Kingdom, pioneering research into painting materials and conservation, ceramics, and stone conservation was conducted by Arthur Pillans Laurie, academic chemist and Principal of Heriot-Watt University from 1900. Laurie's interests were fostered by William Holman Hunt. In 1924 the chemist Dr Harold Plenderleith began to work at the British Museum with Dr. Alexander Scott in the recently created Research Laboratory, although he was actually employed by the Department of Scientific and Industrial Research in the early years. Plenderleith's appointment may be said to have given birth to the conservation profession in the UK, although there had been craftsmen in many museums and in the commercial art world for generations. This department was created by the museum to address the deteriorating condition of objects in the collection, damages which were a result of their being stored in the London Underground tunnels during the First World War. The creation of this department moved the focus for the development of conservation theory and practice from Germany to Britain, and made the latter a prime force in this fledgling field. In 1956 Plenderleith wrote a significant handbook called The Conservation of Antiquities and Works of Art, which supplanted Rathgen's earlier tome and set new standards for the development of art and conservation science. In the United States, the development of conservation of cultural heritage can be traced to the Fogg Art Museum, and Edward Waldo Forbes, its director from 1909 to 1944. He encouraged technical investigation, and was Chairman of the Advisory Committee for the first technical journal, Technical Studies in the Field of the Fine Arts, published by the Fogg from 1932 to 1942. Importantly he also brought onto the museum staff chemists. Rutherford John Gettens was the first of such in the US to be permanently employed by an art museum. He worked with George L. Stout, the founder and first editor of Technical Studies. Gettens and Stout co-authored Painting Materials: A Short Encyclopaedia in 1942, reprinted in 1966. This compendium is still cited regularly. Only a few dates and descriptions in Gettens' and Stout's book are now outdated. George T. Oliver, of Oliver Brothers Art Restoration and Art Conservation-Boston (Est. 1850 in New York City) invented the vacuum hot table for relining paintings in 1920s; he filed a patent for the table in 1937. Taylor's prototype table, which he designed and constructed, is still in operation. Oliver Brothers is believed to be the first and the oldest continuously operating art restoration company in the United States. The focus of conservation development then accelerated in Britain and America, and it was in Britain that the first International Conservation Organisations developed. The International Institute for Conservation of Historic and Artistic Works (IIC) was incorporated under British law in 1950 as "a permanent organization to co-ordinate and improve the knowledge, methods, and working standards needed to protect and preserve precious materials of all kinds." The rapid growth of conservation professional organizations, publications, journals, newsletters, both internationally and in localities, has spearheaded the development of the conservation profession, both practically and theoretically. Art historians and theorists such as Cesare Brandi have also played a significant role in developing conservation science theory. In recent years ethical concerns have been at the forefront of developments in conservation. Most significantly has been the idea of preventive conservation. This concept is based in part on the pioneering work by Garry Thomson CBE, and his book the Museum Environment, first published in 1978. Thomson was associated with the National Gallery in London; it was here that he established a set of guidelines or environmental controls for the best conditions in which objects could be stored and displayed within the museum environment. Although his exact guidelines are no longer rigidly followed, they did inspire this field of conservation. Conservation OnLine provides resources on ethical issues in conservation, including examples of codes of ethics and guidelines for professional conduct in conservation and allied fields; and charters and treaties pertaining to ethical issues involving the preservation of cultural property. As well as standards of practice conservators deal with wider ethical concerns, such as the debates as to whether all art is worth preserving. Many cultural works are sensitive to environmental conditions such as temperature, humidity and exposure to visible light and ultraviolet radiation. These works must be protected in controlled environments where such variables are maintained within a range of damage-limiting levels. For example, watercolour paintings usually require shielding from sunlight to prevent fading of pigments. Collections care is an important element of museum policy. It is an essential responsibility of members of the museum profession to create and maintain a protective environment for the collections in their care, whether in store, on display, or in transit. A museum should carefully monitor the condition of collections to determine when an artifact requires conservation work and the services of a qualified conservator. Work of preventive conservation in a rock wall with prehistoric paintings at the Serra da Capivara National Park. The work consists of filling the cracks to prevent the fragmentation of the wall. A principal aim of a cultural conservator is to reduce the rate of deterioration of an object. Both non-interventive and interventive methodologies may be employed in pursuit of this goal. Interventive conservation refers to any direct interaction between the conservator and the material fabric of the object. Interventive actions are carried out for a variety of reasons, including aesthetic choices, stabilization needs for structural integrity, or cultural requirements for intangible continuity. Examples of interventive treatments include the removal of discolored varnish from a painting, the application of wax to a sculpture, and the washing and rebinding of a book. Ethical standards within the field require that the conservator fully justify interventive actions and carry out documentation before, during, and after the treatment. One of the guiding principles of conservation of cultural heritage has traditionally been the idea of reversibility, that all interventions with the object should be fully reversible and that the object should be able to be returned to the state in which it was prior to the conservator's intervention. Although this concept remains a guiding principle of the profession, it has been widely critiqued within the conservation profession and is now considered by many to be "a fuzzy concept." Another important principle of conservation is that all alterations should be well documented and should be clearly distinguishable from the original object. An example of a highly publicized interventive conservation effort would be the conservation work conducted on the Sistine Chapel. The Lunder Conservation Center. Conservation staff for both the Smithsonian American Art Museum and the National Portrait Gallery are visible to the public through floor-to-ceiling glass walls that allow visitors to see firsthand all the techniques that conservators use to examine, treat and preserve artworks within a functioning conservation Laboratory. Conservators routinely use chemical and scientific analysis for the examination and treatment of cultural works. The modern conservation laboratory uses equipment such as microscopes, spectrometers, and various x-ray regime instruments to better understand objects and their components. The data thus collected helps in deciding the conservation treatments to be provided to the object. In October 2006, the Department for Culture, Media and Sport, a governmental department, authored a document: "Understanding the Future: Priorities for England's Museums". This document was based on several years of consultation aimed to lay out the government's priorities for museums in the 21st century. Museums will fulfil their potential as learning resources (pp 7–10). Museums will be embedded into the delivery of education in every school in the country. Understanding of the effectiveness of museum education will be improved further and best practice built into education programmes. The value of museums' collections as a research resource will be well understood and better links built between the academic community and museums. Museums will embrace their role in fostering, exploring, celebrating and questioning the identities of diverse communities (pp 11–14). The sector needs to work with partners in academia and beyond to create an intellectual framework supporting museums' capacity to tackle issues of identity. The museum sector must continue to develop improved practical techniques for engaging communities of all sorts. Museums' collections will be more dynamic and better used (pp 15–18). Government and the sector will find new ways to encourage museums to collect actively and strategically, especially the record of contemporary society. The sector will develop new collaborative approaches to sharing and developing collections and related expertise. Museums' workforces will be dynamic, highly skilled and representative (pp 17–22). Museums' governing bodies and workforces will be representative of the communities they serve. Find more varied ways for a broader range of skills to come into museums. Museums will work more closely with each other and partners outside the sector (pp 23–26). A consistent evidence base of the contribution of all kinds of museums to the full range of public service agendas will be developed. There will be deeper and longer lasting partnerships between the national museums and a broader range of regional partners. Museums' international roles will be strengthened to improve museum programmes in this country and Britain's image, reputation and relationships abroad. No sector can look with confidence to the future if its key asset is worked harder and harder across an ever broadening range of objectives while the inputs required to sustain it are neglected. It is of major concern to us that the only part of this section which makes any acknowledgement of the need for greater resourcing is the part which refers to acquisitions. The original consultation paper made quite extensive reference to the importance of collections, the role of new technologies, and cultural property issues, but this appears to have been whittled away in the present document. A national survey to find out what the public want from museums, what motivates them to visit them and what makes for a rewarding visit. HR consultants to be brought in from the commercial sector to review recruitment, career development and working practices in the national and regional museums. A commitment to examine the potential for using Museum Accreditation as a more effective driver for improving recruitment, diversity, and career development across the sector. The adoption of those recommendations of the recent House of Lords enquiry into Science and Heritage which have a potential impact on the future of museums. Training in conservation of cultural heritage for many years took the form of an apprenticeship, whereby an apprentice slowly developed the necessary skills to undertake their job. For some specializations within conservation this is still the case. However, it is more common in the field of conservation today that the training required to become a practicing conservator comes from a recognized university course in conservation of cultural heritage. The University can rarely provide all the necessary training in first hand experience that an apprenticeship can, and therefore in addition to graduate level training the profession also tends towards encouraging conservation students to spend time as an intern. Conservation of cultural heritage is an interdisciplinary field as conservators have backgrounds in the fine arts, sciences (including chemistry, biology, and materials science), and closely related disciplines, such as art history, archaeology, studio art, and anthropology. They also have design, fabrication, artistic, and other special skills necessary for the practical application of that knowledge. Within the various schools that teach conservation of cultural heritage, the approach differs according to the educational and vocational system within the country, and the focus of the school itself. This is acknowledged by the American Institute for Conservation who advise "Specific admission requirements differ and potential candidates are encouraged to contact the programs directly for details on prerequisites, application procedures, and program curriculum". In France, training for heritage conservation is taught by four schools : L'École supérieure d'art d'Avignon , L’École supérieure des Beaux-Arts Tours, Angers, Le Mans, L’Université Paris 1, Institut national du patrimoine. Societies devoted to the care of cultural heritage have been in existence around the world for many years. One early example is the founding in 1877 of the Society for the Protection of Ancient Buildings in Britain to protect the built heritage, this society continues to be active today. The built heritage was at the forefront of the growth of member based organizations in the United States. Preservation Virginia, founded in Richmond in 1889 as the Association for the Preservation of Virginia Antiquities, was the United States' first statewide historic preservation group. Today, professional conservators join and take part in the activities of numerous conservation associations and professional organizations with the wider field, and within their area of specialization. These organizations exist to "support the conservation professionals who preserve our cultural heritage". This involves upholding professional standards, promoting research and publications, providing educational opportunities, and fostering the exchange of knowledge among cultural conservators, allied professionals, and the public. ^ "Definition of a Profession". International Council of Museums - Committee for Conservation. Retrieved 18 August 2012. ^ Walston, S. (1978). "The Preservation and Conservation of Aboriginal and Pacific Cultural Material in Australian Museums". ICCM Bulletin. 4 (1): 9. doi:10.1179/iccm.1978.4.4.002. ^ Szczepanowska, Hanna M.. 2013. Conservation of cultural heritage: key principles and approaches. Routledge. ISBN 978-0415674744. ^ Stoner, Joyce Hill. 2005. p. 41. “Changing Approaches in Art Conservation: 1925 to the present” in (Sackler NAS Colloquium) Scientific Examination of Art: Modern Techniques in Conservation and Analysis. Proceedings of the National Academy of Sciences. ^ Gilberg, Mark. (1987). "Friedrich Rathgen: The Father of Modern Archaeological Conservation". Journal of the American Institute for Conservation. 26 (2): 105–120. doi:10.2307/3179459. JSTOR 3179459. ^ "Brief biography of Professor AP Laurie". Archived from the original on 2012-07-14. ^ History. British Museum (2012-06-14). Retrieved on 2012-06-29. ^ a b Stoner, Joyce Hill. "Changing Approaches in Art Conservation: 1925 to the present". The publication exists in two editions. The earlier one is "Scientific Examination of Art: Modern Techniques on Conservation and Analysis" and was published by the National Academy of Sciences in 2003. The later edition of the publication is "Arthur M. Sackler Colloquia: Scientific Examination of Art: Modern Techniques in Conservation and Analysis". It was published by the National Academies Press in 2005. ^ Patent# 2,073,802 U.S. "Art of Oil Painting Restoration", March 16, 1937. Patft1.uspto.gov. Retrieved on 2012-06-29. ^ AIC – Code of Ethics. Conservation-us.org. Retrieved on 2012-06-29. ^ "Ethical issues in conservation". Conservation OnLine (CoOL). cool.conservation-us.org. Retrieved 2017-05-29. ^ Weil, Stephen E. (October 1989). "Too much Art?". ArtNews: 232. ISSN 0004-3273. ^ Andrew Oddy and Sara Carroll (eds). 1999. Reversibility – Does it Exist? British Museum Occasional Paper Number 135. London: British Museum. ^ p. 185. Muñoz-Viñas, Salvador. 2005. Contemporary Theory of Conservation. London: Elsevier/Butterworth Heinemann. ^ Heritage Health Index. Heritagepreservation.org. Retrieved on 2012-06-29. ^ The Future of Museums: A Failure of Vision. Icon.org.uk. Retrieved on 2012-06-29. ^ Holden, John. and Samuel Jones. 2008. It's A Material World: Caring for the public realm. London: Demos. ^ a b AIC – Becoming a Conservator. Conservation-us.org. Retrieved on 2012-06-29. ^ "Formation initiale - Ministère de la Culture". ^ History of the SPAB. Retrieved on 2012-06-29. ^ APVA Preservation Virginia Archived 2008-06-13 at the Wayback Machine. Apva.org. Retrieved on 2012-06-29. ^ About AIC – Overview. Conservation-us.org. Retrieved on 2012-06-29. Charola, A. Elena, and Robert J. Koestler, eds. Pesticide Mitigation in Museum Collections: Science in Conservation: Proceedings from the MCI Workshop Series. Smithsonian Contributions to Museum Conservation, no. 1. Washington, D.C.: Smithsonian Institution Scholarly Press, 2010. Copies of this volume are available for free pdf download from the Smithsonian's digital library by clicking on the included link. Pergoli Campanelli, Alessandro, La nascita del restauro. Dall'antichità all'alto medioevo, Milan, Jaca book 2015 ISBN 9788816412996 . Wikimedia Commons has media related to Conservation-restoration. Conservation OnLine (CoOL) Resources for Conservation Professionals, "CoOL, an online resource operated by the Foundation of the American Institute for Conservation is a full text library of conservation information, covering a wide spectrum of topics of interest to those involved with the conservation of library, archives and museum materials. It is a growing online resource for conservators, collection care specialists, and other conservation professionals." Grimwade Centre for Cultural Materials Conservation, a Department of Melbourne University. DOCAM — Documentation and Conservation of the Media Arts Heritage "to address the issues of preserving and documenting digital, technological and electronic works of art." Hornemann Institute of the HAWK Hochschule für angewandte Wissenschaft und Kunst (University of Applied Sciences and Arts) Hildesheim/Holzminden/Göttingen which provides E-Publications, mostly of European students and online courses in the field of heritage conservation as well as links to other conservation-related Websites. ICOMOS Open Archive: both an institutional archive of the scientific documentation produced by the International Council on Monuments and Sites (ICOMOS) and also a subject archive open to the entire international scientific community in the field of heritage conservation. museumkids/What is Art Conservation? – The Metropolitan Museum of Art, 2001. Research Resources at the Getty Conservation Institute, including the AATA (formerly "Art and Archaeology Technical Abstracts") search engine, bibliographies for various topics, cultural heritage policy documents, and links to other conservation-related Web sites. Caring for Heritage Collections Online Course. An online course in preventive conservation issues for museum professionals, University of Melbourne, School of Historical Studies: Centre for Cultural Materials Conservation. Theory and practice of conservation . Objects Conservation — Provided by the Division of Anthropology, American Museum of Natural History. Freeview Video 'Science and Fine Art' by David Bomford of the National Gallery. A Royal Institution Lecture showing how scientific techniques aid conservation by the Vega Science Trust. Animation Art Conservation discusses the preservation of animation art and has many interviews with animation artists that detail their original intent and frequently how they made their art. Conrad Schmitt Studios has been conserving artwork for buildings of architectural, historic, and religious significance since 1889. EverGreene Architectural Arts, Inc. specializes in conservation and restoration practices globally. Oliver Brothers Fine Art Restoration and Conservation, Boston-New York has been restoring and conserving paintings, works on paper, icons, murals, sculpture, gilded objects, and antique and contemporary picture frames for more than one and one-half centuries . Established in 1850, Oliver Brothers Art Restoration and Art Conservation is the oldest art restoration company in the United States. Anthony Moore Painting Conservation, York, ME Has been in operation in the Northeast for over 20 years, Anthony Moore Painting Conservation moved to its current location in York, ME in 1991. They have conserved and consulted on numerous paintings for museums, auction houses, historical societies, galleries, insurance companies, as well as a long list of private clients. ConservArt, Boca Raton, FL George Schwartz has been active as a conservator in private practice since 1963. Schwartz is a currently a Professional Associate Member -The American Institute for Conservation of Historic & Artistic Works (AIC). Spicer Art Conservation. Gwen Spicer is a textile conservator in private practice for 20 years. Spicer is a Fellow of The American Institute for Conservation of Historic and Artistic works. Spicer Art specializes in the treatment of historic flags and banners, and textile artifacts.